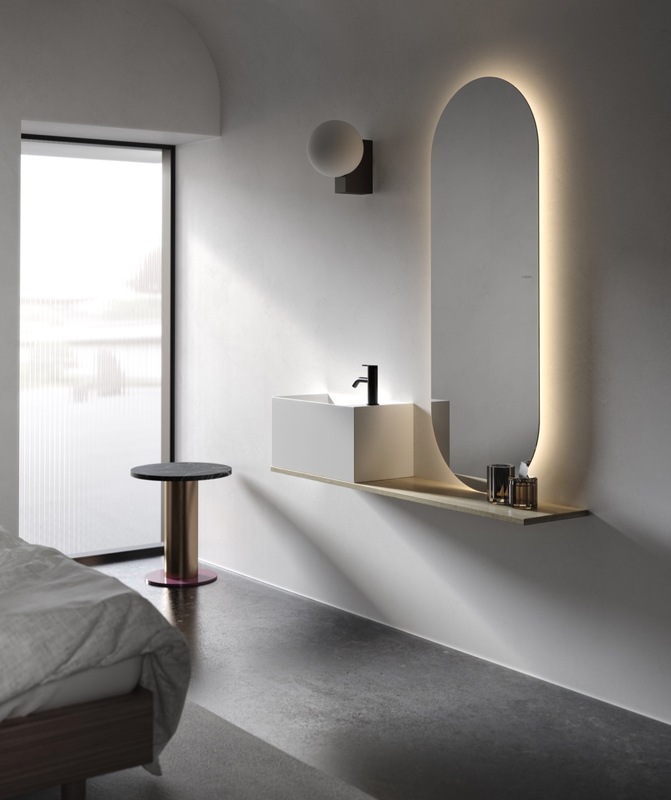 Products designed for the bathroom are shrinking—with graceful results—as seen at ISH 2019. Held in Frankfurt am Main, Germany from March 11-15, the water and energy fair is one of the largest in the industry, every two years attracting some 200,000 visitors and more than 2,500 exhibitors. Space-saving was just one trend that abounded at this year’s fair. Others worth noting: Toilets are now predominately rimless with their plumbing tucked away, bath furniture no longer reads as so, and the 1990s stereo is back in full glory—in the shower. From trim minimalistic toilets to tiny sinks and compact collections with smudge-proof steel, here are 15 of our favorite finds. One day the sink woke up and discovered it was exiled to only two areas of the house. No longer. 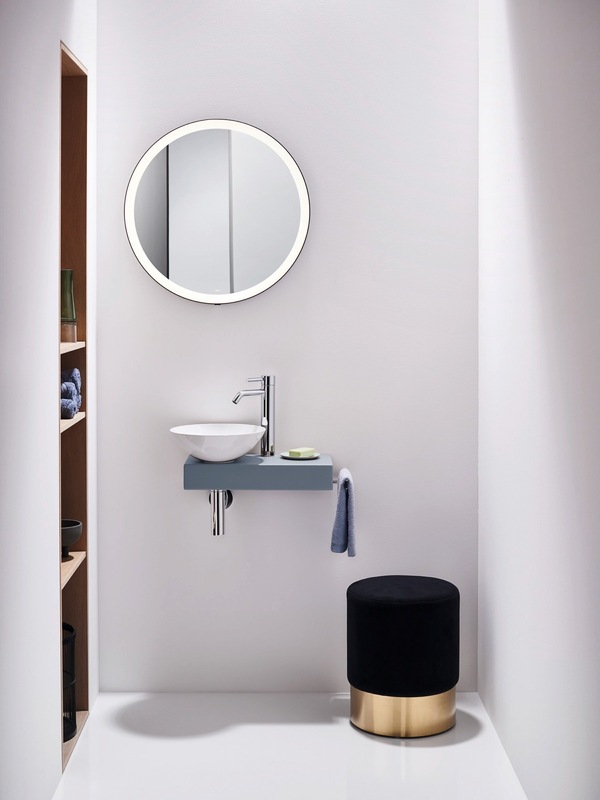 Small on size, big on personality, the Facett washbasin by Soda Designers for Inbani makes a wash-up possible in just about any room—without sacrificing style. The rimless revolution continues in the field of toilet design. These chambers for bacteria are difficult to clean and, it turns out, superfluous. Rimless and slim, the One by Meneghello Paolelli Associati for Artceram also has a hinge-free, easily removed seat cover—another perk that could make it the one for you. Showers titillate all the senses these days. Case in point, the AquamoonATT multi-sensory shower by Michael Neumayr for Dornbracht. "Soothe" and "Nurture" are among the touchscreen-activated programs choreographing water flow, light, and even fragrance. 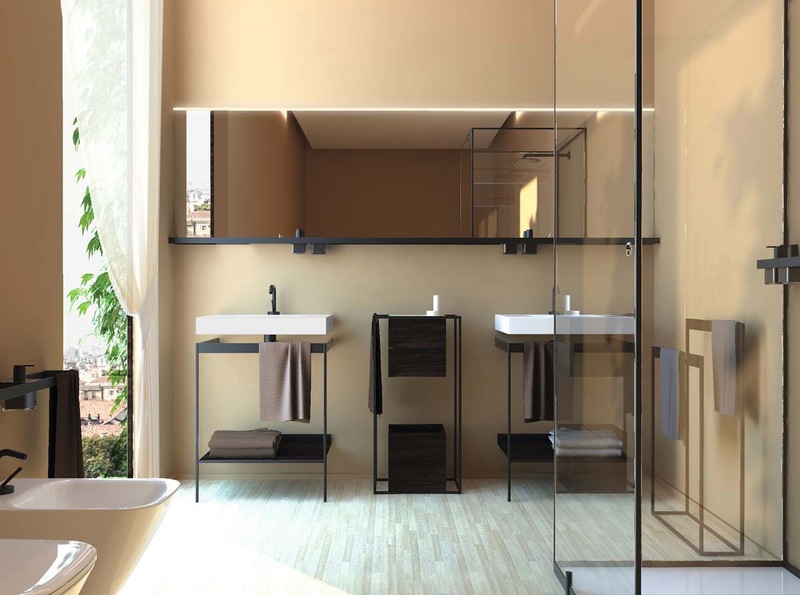 The Indissima bathroom collection by Matteo Thun and Antonio Rodriguea for Inda dresses up this area from top to bottom—with furniture, shower wall, lamps, mirrors, and accessories in smudge-proof, powder-coated steel with wood accents. Geared for more petite bathrooms or the guest toilet, the Piccolo Novo from Alape is an update to Piccolo, launched in 1997. Slightly wider and available in three faded matte finishes, the new version delivers more precious counter space. Interior devices regulate water—without sacrificing spray power—within the single-lever, chrome-finished Nikko brass mixer from Zucchetti.Kos. 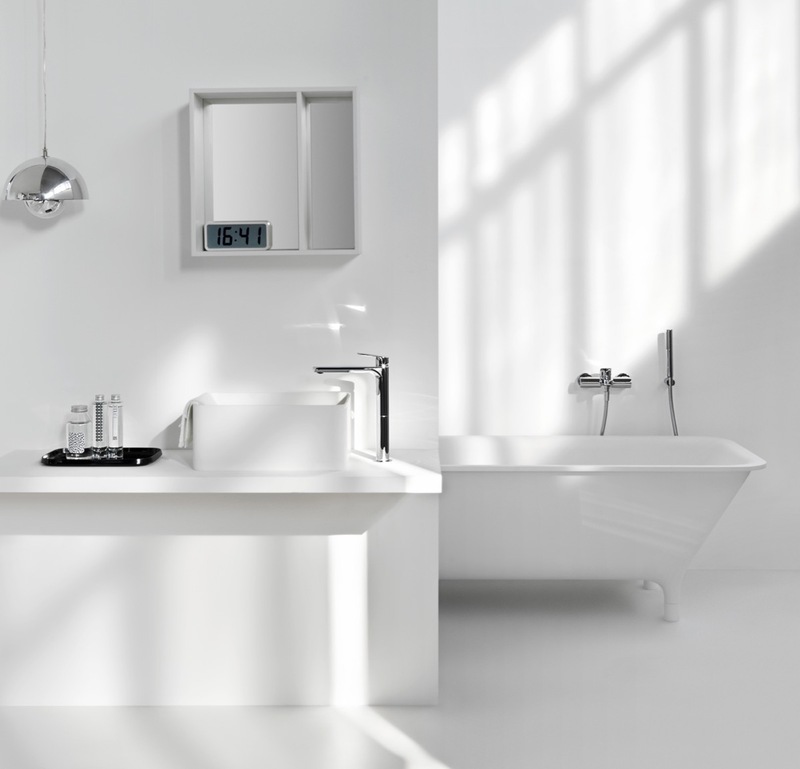 Included in the new all-encompassing Viu/Xviu by Sieger Design for Duravit—a furniture range addressing washing, bathing and toilet area—the XViu free-standing tub has a metal frame offered in two matte shades, which offer a striking contrast to the high-gloss white acrylic tub. 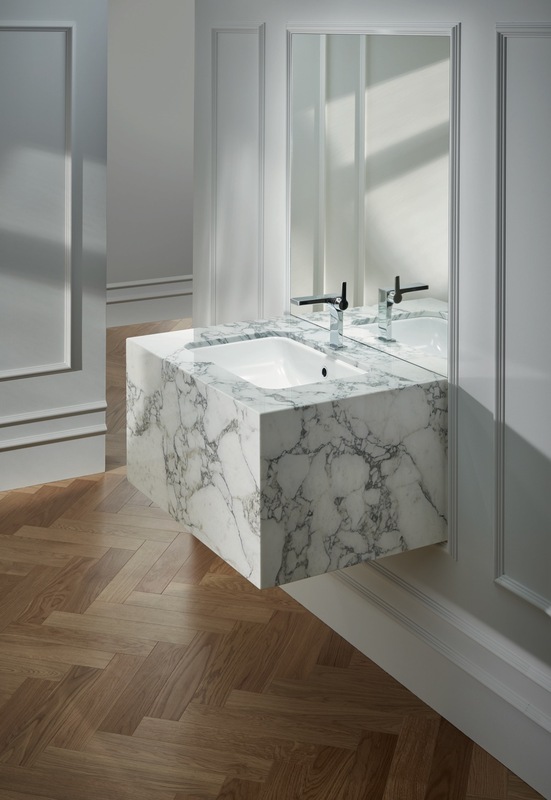 Tucking neatly into countertops—such as those in natural stone or concrete—the BetteOne glazed titanium steel undermount washbasin from Bette allows for generous counter space. 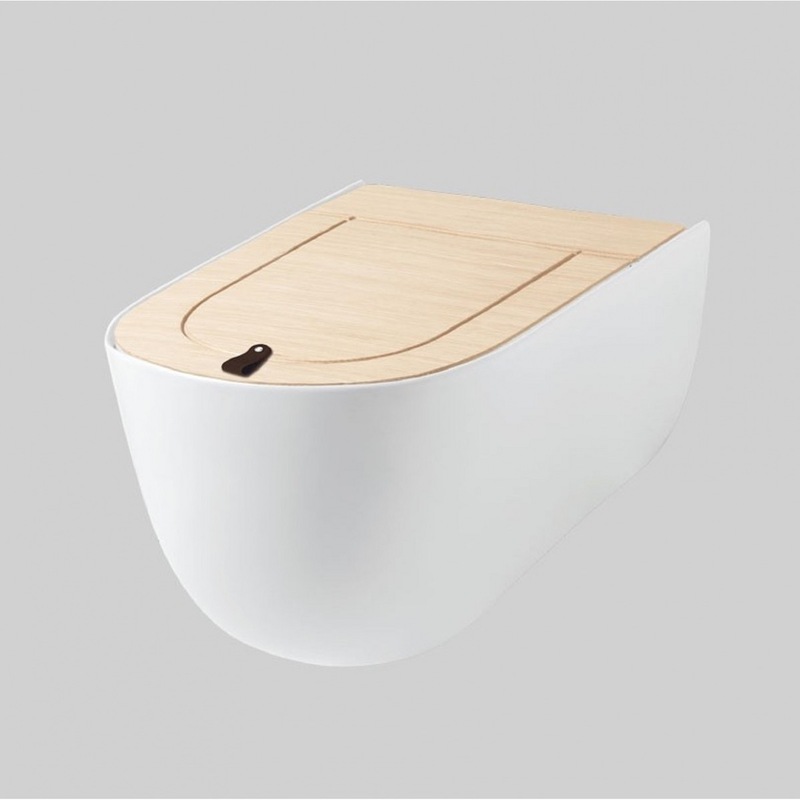 Available in assorted colors and finishes, the collection also includes undermount washbasin in two additional geometries. 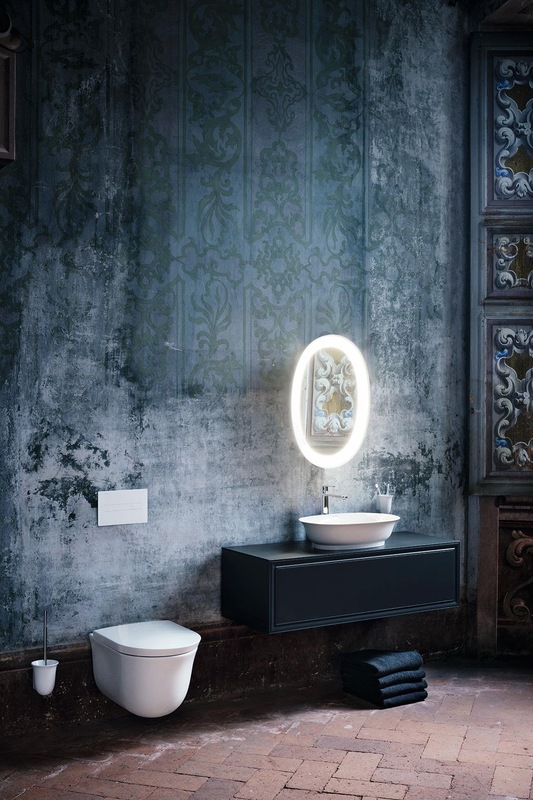 With the power to create slim yet robust forms, trademarked ceramic material SaphirKeramik, is the medium of choice for the New Classic collection by Marcel Wanders for Laufen. 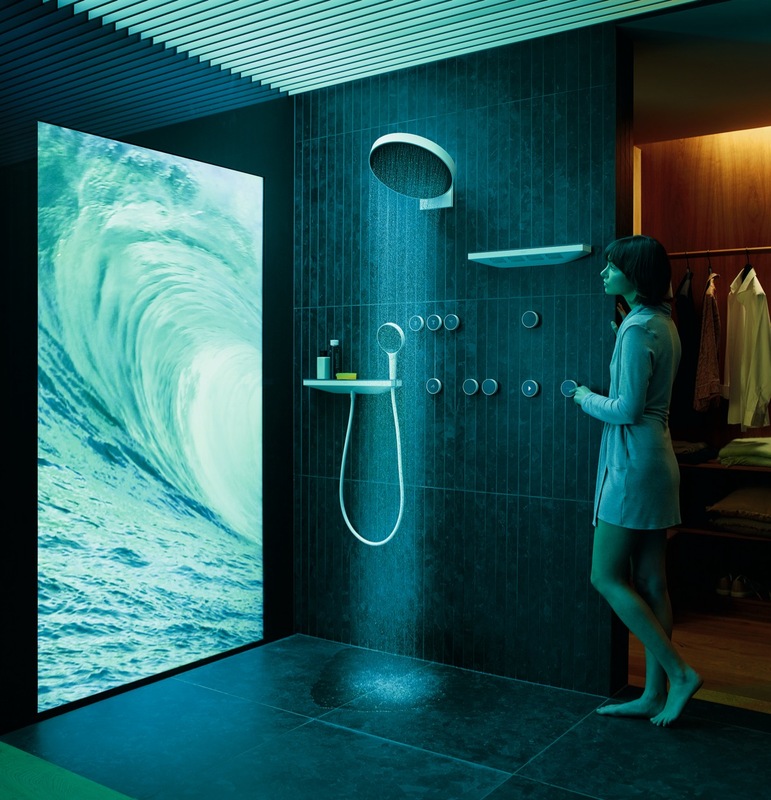 The RainTunes digital shower system from Hansgrohe, with water, light, sound, and fragrance sensory experiences, is adjustable via moveable Bluetooth-connected control buttons. A few nostalgic product designers lament the day the dial stereo system of the 1990s disappeared. 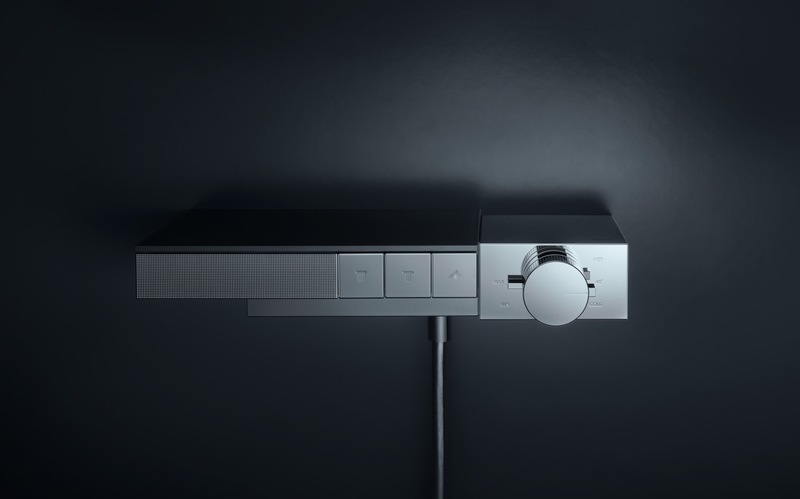 The Hi-Fi collection of thermostatic bottom mixers from Gessi, offered as both built-in and external, returns that familiar aesthetic to the public eye. The brass Axor Edge mixer by Jean-Marie Massaud for Axor, available in seven polished hues, is once again, a tribute to the stereo of days past. A state-of-the-art diamond-cutting machine captures its precise symmetry. 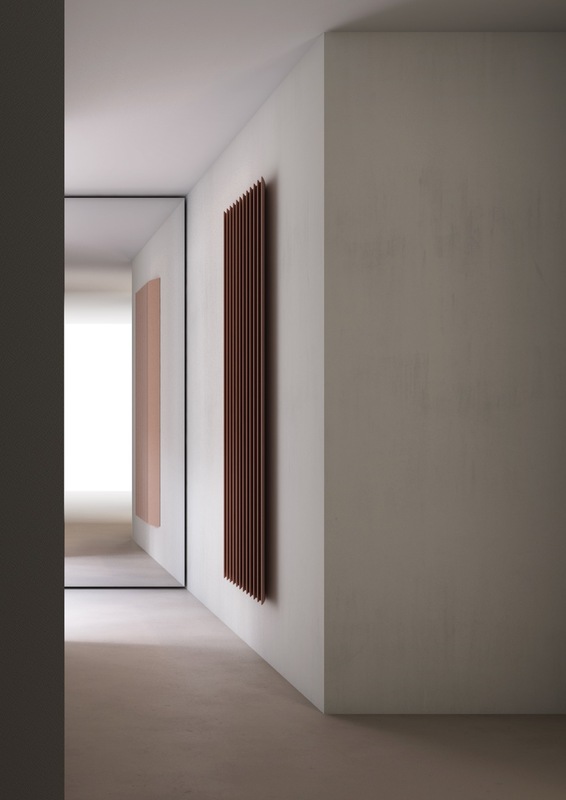 Radiator or wall art? The graceful elliptical ribs forming Step-by-Step by Alberto Meda for Tubes Radiatori makes it hard to tell. Photography courtesy of Victoria + Albert. 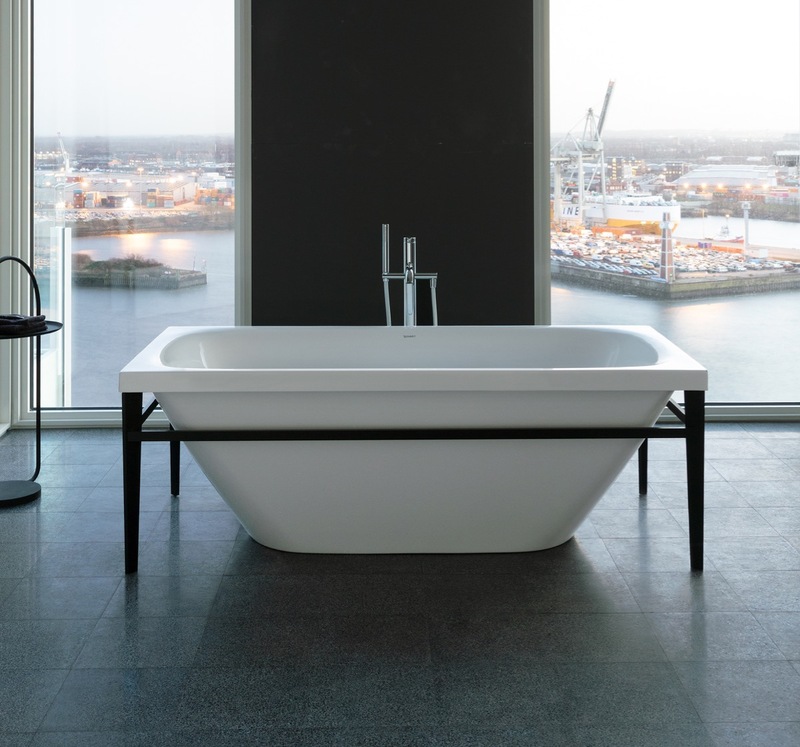 Designer Steve Leung toasts the beauty of historic Song dynasty ceramics with the Taizu round bathtub for Victoria + Albert. 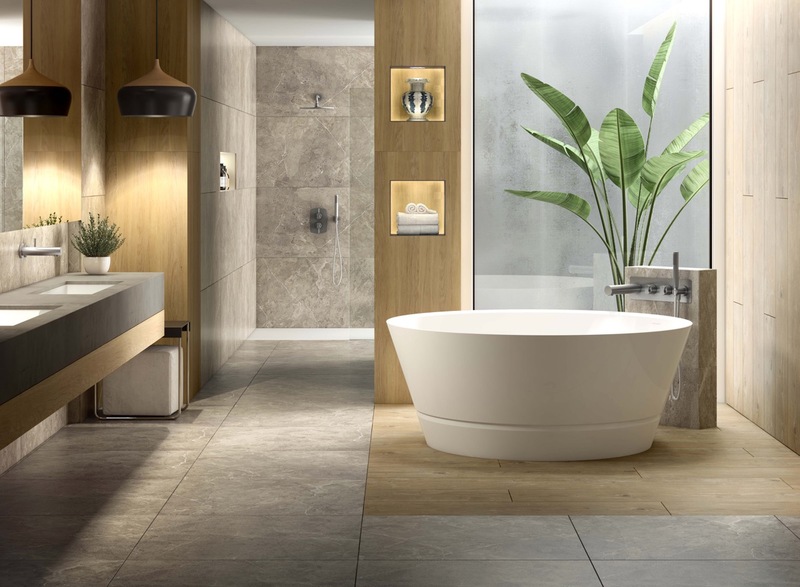 Named after Song Dynasty emperor Taizu and fabricated from a blend of manufactured stone and resin, this bath can meet the most royal of demands with 194 hues in glossy or matte finishes. Photography courtesy of Antonio Lupi. 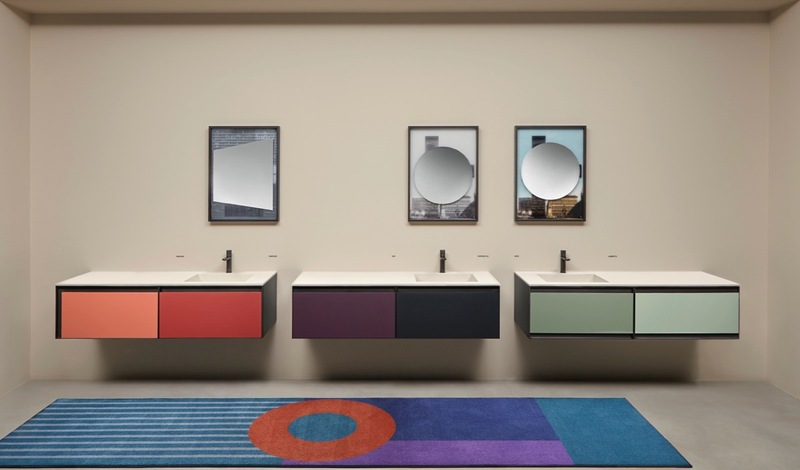 Launched in Milan in 2018, Atelier, a series of bathroom furniture by Mario Ferrarini for Antonio Lupi, premiers in six new lacquered colors. Available in matte, embossed, and glossy finishes, the hues have names that evoke the best of Italia—think Vino and Vespa. Looking for more kitchen & bath? 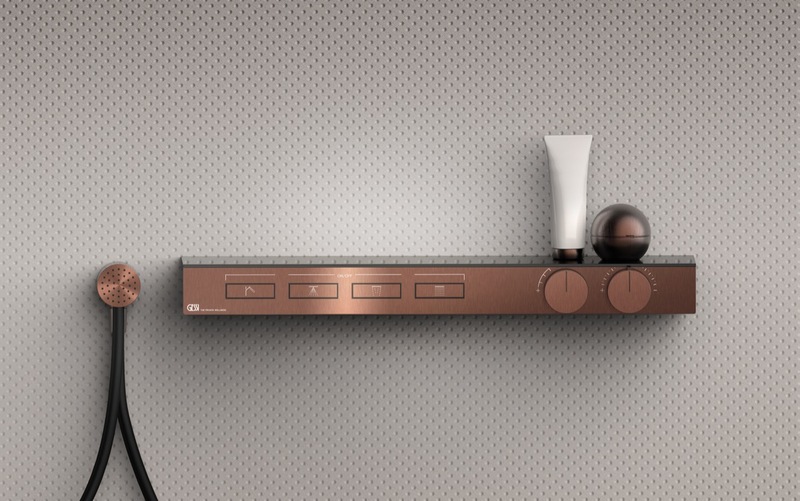 Check out our Top 10 Product Picks from KBIS and Best of Kitchen & Bath special issue.